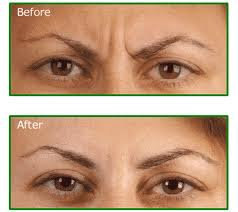 Botulinum toxin therapy for facial wrinkles and lines is an injection treatment to reduce facial expression lines. Botulinum toxin has been used for many years and is licensed for treatment of spasticity, and various facial tics and spasms. It is being increasingly used in medicine for treatment for tension headaches, migraine, and whiplash injuries to the neck, and is now licensed for the treatment of excessive axillary sweating, hyperhidrosis. It has been used widely since the early 1970’s for this purpose in the UK, and is generally a very safe treatment. Skin ageing is associated with the development of lines on the face and is caused by the action of muscles on the skin, and can by exacerbated by sun-damage and smoking. Botulinum toxin relaxes specific facial muscles that cause unwanted lines, for example, the deep creases between the eyes, crows’ feet and forehead lines. How does Botulinum Toxin or BOTOX work? Botox injections relax the muscles and prevent them from furrowing together, creating frown lines by inhibiting the release of Botulinum Toxin preventing nerve impulses arriving at the muscle to cause contraction. The muscle is therefore temporarily relaxed, but this effect is completely reversible in time, and the muscle itself is not damaged. At Shumailas Hair and Beauty salons, A group of therapist and practitioners closely observer the area then then proceed to the details of Botox treatment for wrinkles and fine lines. A number of injections will be required, and these generally cause only temporary discomfort. The effect will develop gradually over a period of three to five days, and will generally be maximal at about two weeks, depending on various factors, including the initial magnitude of the lines, the size of the underlying muscles, and the amount of Botulinum Toxin used. The effect will last between two to seven months, the average being observed at the Shumailas Laser clinics or Shumailas hair and beauty research department is four to five months minimum, depending on skin and muscular resistances. Are there any Side effects of BOTOX or Risks of BOTOX Treatment? Immediate after treatment, there will be some mild swelling and redness, and this unusually settles within a few hours, as with any therapy, there is always a risk of infection, but this is very uncommon. If infection does occur, report to your GP / dermatologist or visit Nearest Shumailas Hair & Beauty therapist clinics. Bruising at the injection site may occur, and can be exacerbated by Warfarin and Aspirin treatment. The relaxation of the forehead muscles may rarely increase the risk of sleep line development, but this may be resolved by treatment with dermal filler. Some experience a mild headache but tension headaches are usually improved. and extremely rare side effect is generalized weakness and fatigue. If you are prone to cold sores. treatment may precipitate an eruption. For reasons that are not understood, some patients may be resistant to the effects of Botulinum Toxin, and these, treatment may not be as effective or as long lasting. Precautions or Measures for BOTOX or Botulinum Toxin? You should not undergo treatment if you are pregnant or breastfeeding. There are certain neurological conditions that can be made worse by treatment and the use of certain medications may not be appropriate with Botulinum Toxin or Botox. Are there alternative Treatment of BOTOX? There are alternative treatments for lines and wrinkles other than Botulinum Toxin/botox, and these include: Dermal fillers, chemical peels, laser treatments and surgical treatments. Is BOTOX best for me? The best candidates for Botox are men and women who suffer from muscle tension in the face. The ideal patient is in general good health, and is realistic about the scope and results of the procedure. Patients with neuromuscular disorders are usually not good candidates for the Botox injection procedure. Botox is best for you if you want only natural purified substances to be used on your skin, as in Shumailas Hair & Beauty salons, The practitioner, doctors and therapist only use Natural Protein Injections from Best brands in the market such as Botox(R) Dysport and xeomin, depending on the requirements and need for the skin. We provide the best price for Botox in London, Essex, and Greater London and now expanded the chain of Botox Clinics and Cosmetic Clinics for Botox treatments in the whole of UK (United Kingdom). Who Should Use BOTOX ? Just like Celebrities, those male or female personalities who do not want expression lines seen in frown, forehead, crow’s feet, nose (bunny lines), around the mouth (smoker’s line, smile fold, marionette fold), chin (chin pits) and neck (spasmodic turkey fold), furthermore it is widely used to increase the quality of skin and reduce the tethering and visibility of scars that are attached to muscle. In addition, Shumailas hair and beauty salons and cosmetic clinics also use Botox for Migraine, Muscle sprain and facial asymmetry treatments in UK. Cost of BOTOX treatment or Best Price of BOTOX in UK ? As compared to conventional plastic surgery, the cost of Botox is relatively low. The cost per injection treatment is usually around £200-250 / area and 350-500 on few areas, but this cost may vary according to geographic location and specific specialist. At Shumailas Hair and beauty Clinics, the price for one area is £125 and three areas is only £249, which is declared to be the UK’s cheapest and best price for BOTOX, whilst using the best brands which last longer and give better result.